In this type of neutral grounding, the neutral of the system is connected to ground through one or more resistance. 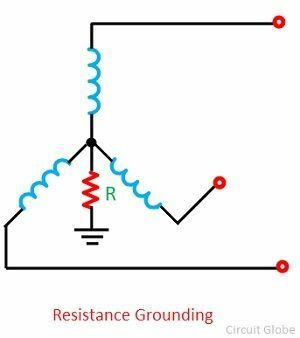 Resistance grounding limits the fault currents. It protects the system from transient overvoltages. Resistance grounding decreases the arcing grounding risk and permits ground-fault protection. The value of resistance used in the neutral grounding system should neither be very high nor be very low shown in the figure below. A very low resistance makes the system to the solidity grounded, whereas a very high resistance makes the system ungrounded. The value of resistance is chosen such that the ground-fault current is limited, but still sufficient ground current flows permit the operation of ground faults protections. In general, the ground fault may be limited up to 5% to 20% of that which occur with a three-phase line. 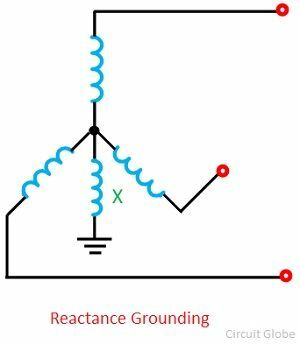 In reactance grounded system, a reactance is inserted between the neutral and ground to limit the fault current as shown in the figure below. To minimize transient overvoltages, the ground fault current in a reactance grounded system should not be less than 25% of the three phase fault current. This is considerably more than the minimum current desirable in resistance grounded systems.